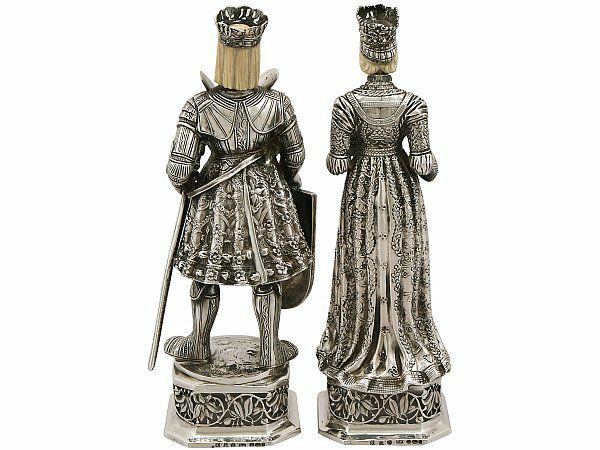 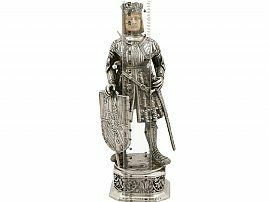 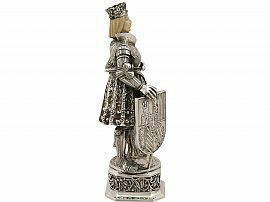 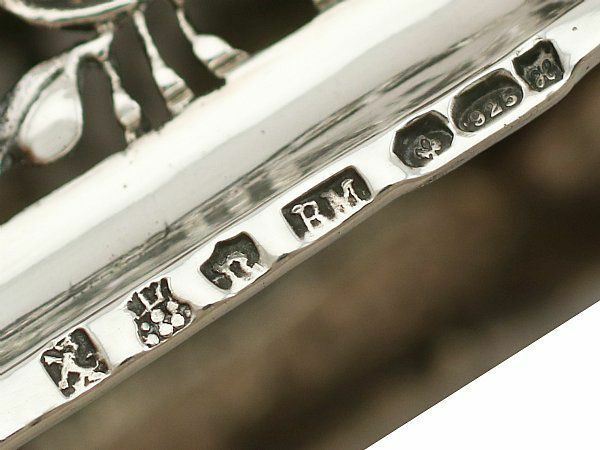 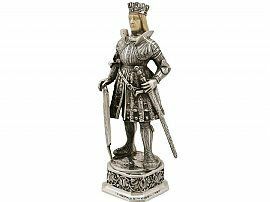 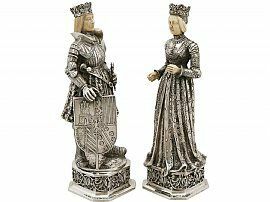 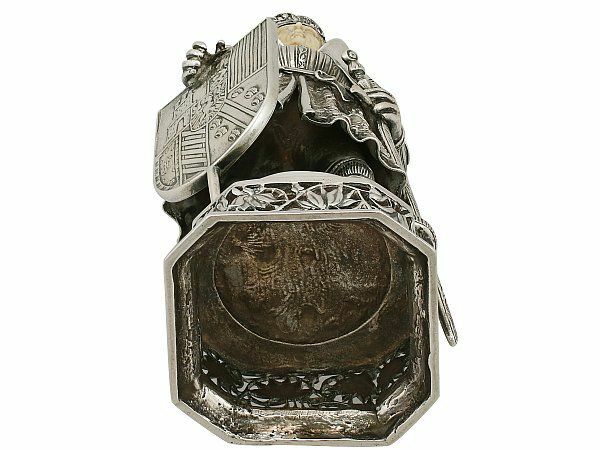 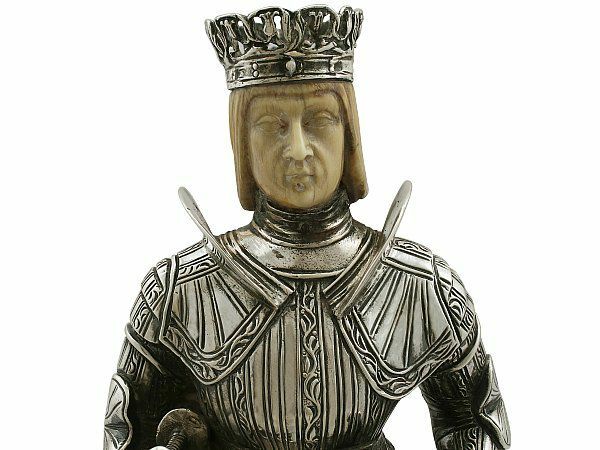 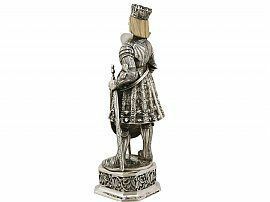 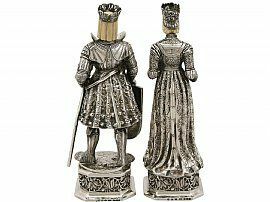 These exceptional antique German silver table ornaments have been realistically modelled in the form of a duke and duchess wearing ducal coronets. 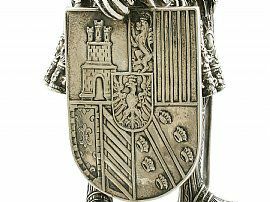 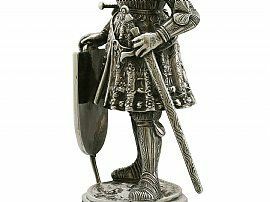 The armoured duke ornament features a shield in his dexter hand whilst grasping his sword with the other. 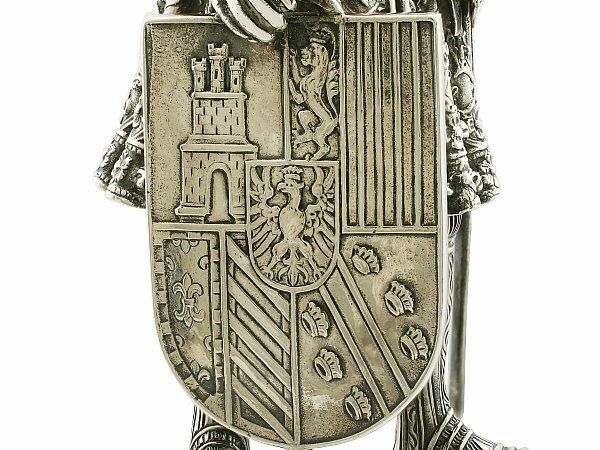 The spiked shield is embellished with an impressive coat of arms depicting quarterly, I a towered castle, II four pallets, III party per pale fleur-de-lys and five bendlets bordered and IV two bedlets charged with six coronets; overall an inescutcheon charged with a crowned eagle displayed. 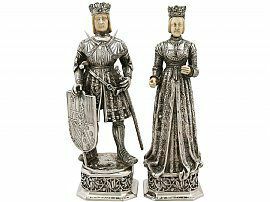 The Duke and Duchess are dressed in luxurious floral garments embellished with chased decoration replicating the fabric's patterns and textures. 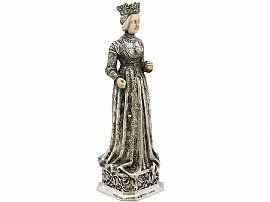 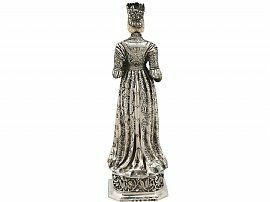 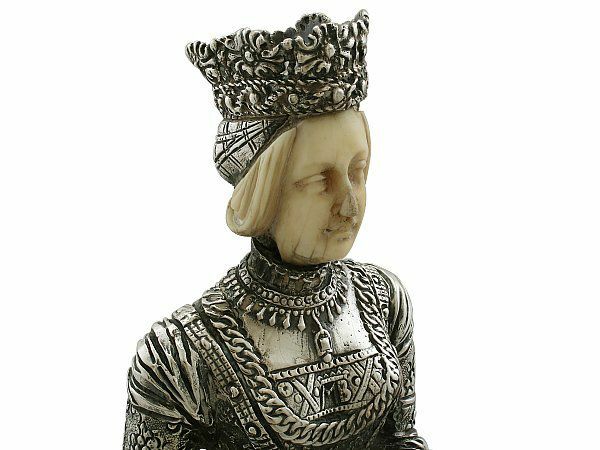 Each German silver figurine retains the original and impressive carved ivory head, displaying the fine details of facial features and facial hair. The Duchess is further ornamented with carved ivory hands. 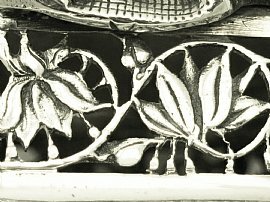 Each base has a square cut cornered form and is ornamented with impressive band of pierced undulating floral and leaf ornamentation. 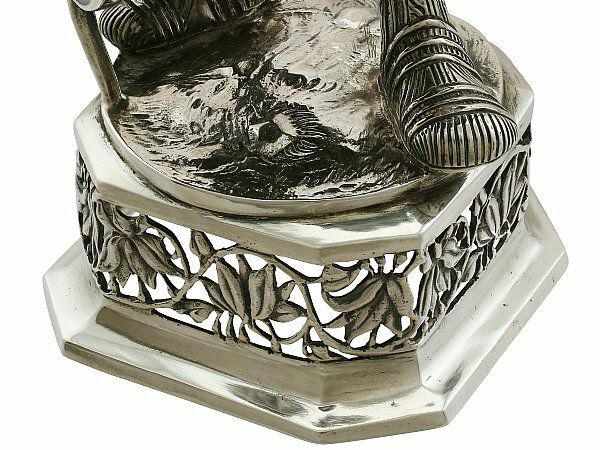 These antique table ornaments are an exceptional gauge of silver, exceptional quality and in exceptional condition. The chased decoration is very crisp. Full hallmarks struck to the surface of the base of each ornament are all very clear. 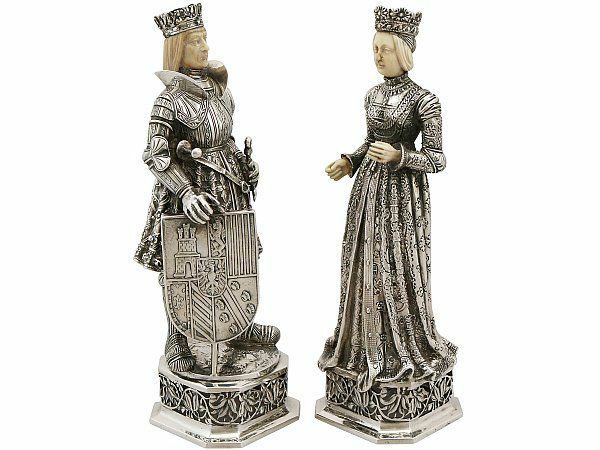 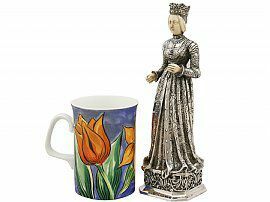 Reflections in photographs may detract from the true representation of these Duke and Duchess antique silver figurines.